Countess Elena d’Artois is a Companion of the Order of the White Scarf. This article is from a Facebook post in which she contemplated the relationship between Æthelmearc’s Ladies of the Rose and Garnet and the rapier fighters, most especially the White Scarves. 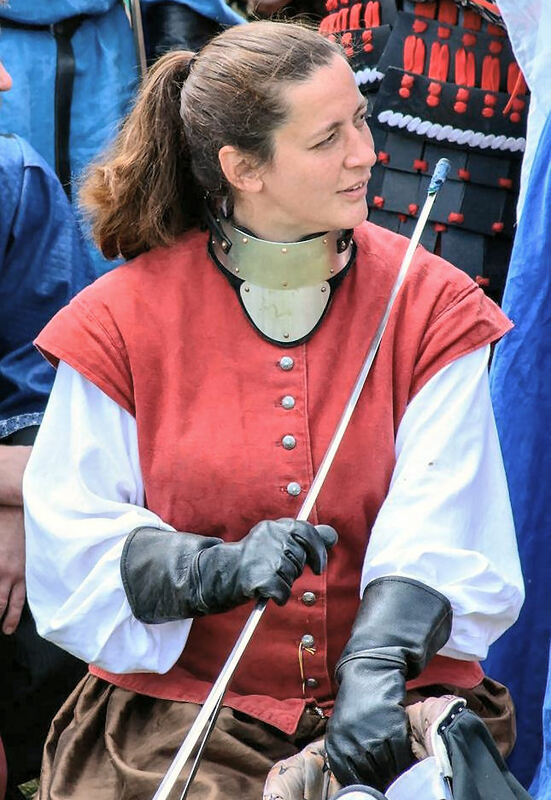 Countess Elena at the Rose Tourney at Pennsic 43, where she was sponsored by Countess Kallista. Photo by THL Juan Miguel Cezar. 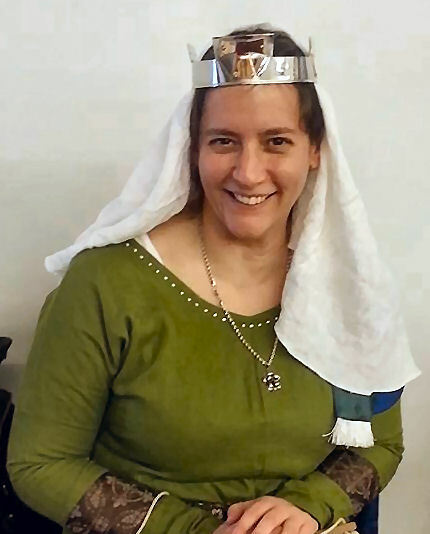 The Queens of Æthelmearc, Roses, and Garnets have a very special and ever-changing relationship with the White Scarves and fencing community. Their paths have changed from guardian, to guide, to confidante, to dear friend, to momma bear, and who is in what role changes as the community changes. When I was a terrified first time princess, three White Scarves especially changed my path. They helped me to understand the art that is fencing (which I still don’t understand as well as I would like…. but we all grow, every day, together). They and the fencers welcomed me and supported me in that role, so much so that I have stayed and now serve in that community. Don Bastiano, Don Corwin, Don Christian and others were wonderful guides at that time. They taught me the Cult of the Queen, the honor of being a target, a courtier, a scholar, and a soldier. These are integral to the role of the fencer in the Society and those things that we learn in our art martial are skills that help us be successful in life. Focus. Determination. Discipline. Respect. Service. Pursuit of excellence. Kindness. Standing for what is right. A kind word can mean the difference to someone, and you never know who you touch. The art of defense can be elegant. One need not be a brute to eviscerate an enemy. Those are the things that the fencers taught a Rose-to-be. As a fencer I watch the Roses. Those qualities that they embody and protect are those that we aspire to. Service to a greater community. Excellence and Chivalry are more important than victory. Gentility. The impact of words we speak. Inspiration. Loyalty. Honor. Grace. The responsibility of position doesn’t end when you leave the field. Leading by example in all things. Those are the things that I learn from the Roses I watch. So much yet to learn. 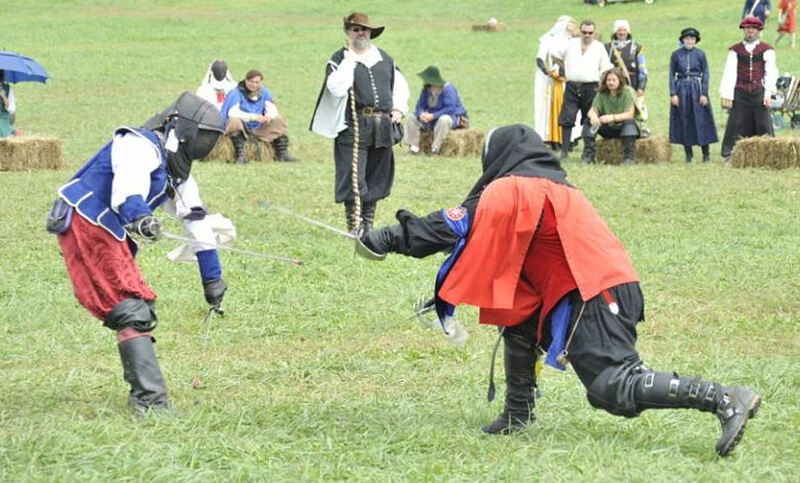 Lord Mark le Gabler (at right) competing in the Rapier Champions Tourney at Pennsic 43. He was inducted into the White Scarf the following month. Photo by THLord Juan Miguel Cezar. Our kingdom’s Queen’s Rapier Championship Tournament is coming. Take this opportunity to look at your Queen and the Ladies of the Rose who support you. Spoil them. Revere them. Respect them. They are the Ninjas of Æthelmearc. Do something nice for a Lady of the Rose when you see them next. Coronation is this weekend. What a wonderful opportunity to share a drink or a piece of chocolate. Countess Elena, photo by Mistress Chrestienne de Waterdene. That said – if you would do those wonderful things for a Lady of the Rose – also do those things for someone you don’t know. Reach out to a new person and say hello. Offer a stranger a beer. Give a piece of chocolate to someone who might like it. You don’t have to be a Rose to appreciate a kind word, a drink, or a sweet. Those skills we learn in our game are the same skills that help us to make a better world in every area of our life. We serve a larger community. Kindness and respect are universal. But if learning to do it for one person or group of people teaches us how to do that better, then we have truly learned and grown as a people. My fellow fencers, what do you see as the relationship between the Roses and the fencers? How do they inspire you?